demijohns has grown rapidly and I just picked up two more for a steal! This was another $10 find that I found at a flea market last week and decided to turn it into a lamp. I simply bought one of those lamps kits at Home Depot and had the hubby put it together for me. The cord hanging behind the lamp drove him CRAZY!! So he went out and bought a drill bit that goes through glass and sent the cord up the inside of the bottle. I love it so much better this way too and for a change I didn't have to ask him to do it lol! I had the burlap shade on hand and just added the striped trim to it...I think I still might order a new burlap shade from PB. One last look from the other side. Here's a little peek at what I just worked on for our youngest's room. She was ready for some changes in her room so stay tuned! She thinks she's a decorating DIVA now lol!! I wanted to show you guys the new jute runner I bought for my kitchen after the wood floors were installed. I love using a long runner in front of my sink and dishwasher...it keeps the floor clean and it prevents those dreaded water spots! 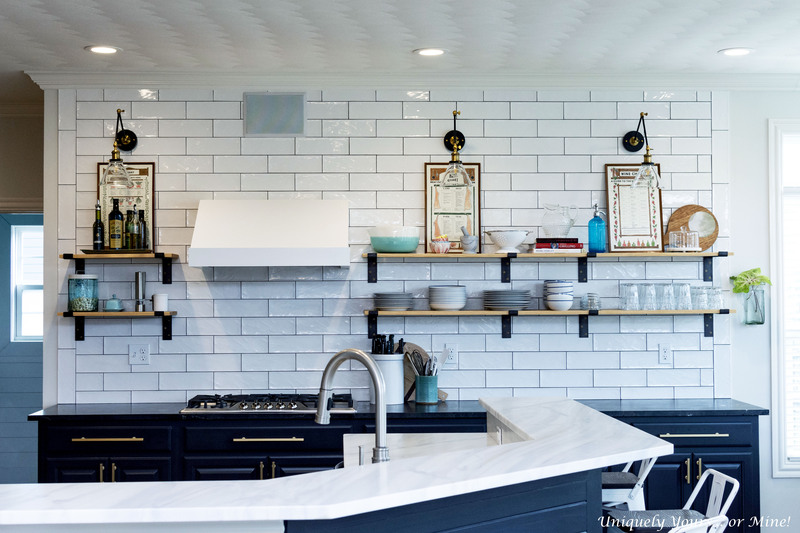 This time I ordered one with a black trim...I like the way it ties in with the black island. At 8ft. long it covers the whole area. It also has a rubber backing which I thought would be great for keeping it in place...but that wasn't the case! So when I was contacted by the nice people at Rug Pad USA asking if I would like to try out one of there rug pads I said sure! 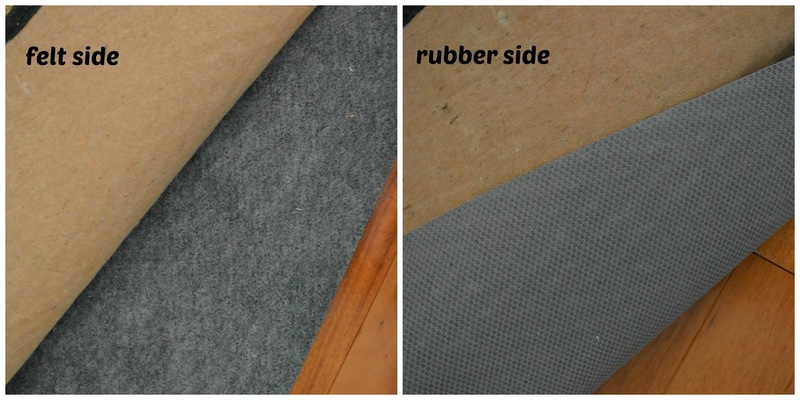 I chose the Superior Lock rug pad for hardwood floors...it has both a felt side and rubber side. Let me tell you friends after adding this rug pad my rug does not move at all...love that!! I also love that their pads are eco-friendly and made in the USA! They ship immediately so it arrives quickly too. I loved this pad so much I just ordered another one just like it for the 8x10 area rug in my family room. Thanks so much for stopping by have a super week! Today I'd like to show you the water feature we had added to our pool deck. We had this added the end of last summer I just never got around to showing you guys. My husband loves waterfalls and fountains so we had the mason who built our stone walls and front pillars build this for us. It was the perfect thing to fill in this empty corner. We love sitting around the pool and hearing the sound of the flowing water...it's so peaceful! I added three large Portulaca plants to the ledge on the top. They thrive in the full sun. Our crane stands watch in between the fountain grass. I planted three of them around here. We're so happy we added this water feature to our pool deck. Do you like water features or fountains mixed in with your landscaping? I haven't been there in over a year! It was definitely worth the drive...because I didn't come home empty handed!! Love the patina on this one! Only $28 for this nice size demijohn. Who says copper is just for the kitchen! I hung these near the front door. Love the way they look here. My cane collection is growing nicely! Wishing you all a happy and safe 4th of July! !